September 2011 – He Said What?! As I mentioned in my last blog, Aaron has a tendency to describe people by their physical attributes, not by their names. He’s doing much better with that now that he’s been at Paradigm, has stability there, and has made friends. But his old habits are hard to break! All the times that I’m not allowed to laugh really can’t be good for me. Author hesaidwhatksPosted on September 30, 2011 Categories Uncategorized1 Comment on WHAT Kind of Teeth? Another characteristic of persons with Asperger’s Syndrome falls under the category of social interaction. They tend to be insensitive and lack tact. That’s putting it mildly. Aaron also lacks discernment concerning what questions are appropriate to ask someone, as well as what questions are inappropriate. For instance, he might think it’s wrong to ask you how you broke your arm but think it’s all right to ask you how much money you have in the bank. While trying to help Aaron understand some areas that are personal and shouldn’t be delved into with people, we drilled into him that he should never ask anyone how much they weigh. He tends to describe others by some physical characteristic, such as saying that so-and-so has a big nose or is fat. Therefore, we went over the weight issue many times with Aaron, saying, “Aaron, never ask anyone how much they weigh. Especially NEVER ask a girl what she weighs.” “How come?” he asked. And again we’d explain that this issue is very personal, especially for a girl. Do NOT ask a girl what she weighs! Never! Period! Gary and I add lots of amendments to Aaron’s rules. All parents know that each of our children is unique. The way that we communicate with one may not be the best way to communicate with the other. For a child with Asperger’s Syndrome – well, they pretty well re-write all of our rules. Even though Aaron is almost 27 years old, we still find ourselves having to stop before we speak and remember the best way to approach him on his literal, concrete terms. An example of this fact happened several years ago. Aaron had done something wrong – I don’t even remember what it was. As we ate supper that night, Gary began talking to Aaron about it. “Aaron, I know you did such-and-such today. Let’s talk about it.” Aaron: “I did not, Dad!” Gary: “Well, Aaron, I know you did that today.” Aaron: “No I didn’t!” Gary: “You may as well quit denying that you did that today and let’s just talk about it.” Aaron: “I did NOT, Dad!” This continued on for a few minutes and soon Gary realized that he was getting nowhere with Aaron. It’s one of those “I want to put my head in a pillow and scream” type of moments! And somehow whatever he did – did NOT seem as important anymore. Author hesaidwhatksPosted on September 29, 2011 Categories UncategorizedLeave a comment on Today!! Every year I order a box of peaches from my friend, Nancy, here in Goddard. The peaches actually come from Colorado and arrive in Cheney at Nancy’s aunt’s house. Cheney is a small town just southwest of us. Believe it or not, I’ve never actually driven to Cheney. Cheney Lake, yes – but not to the town of Cheney. Nancy has a job this year that was going to make it very hard for her to pick up everyone’s peach orders, so I offered to do it for her. She told me where her aunt lives – just a mile and a half west of Cheney, right off of MacArthur Road. Very easy to get to! And even for me, who is sometimes directionally challenged, Kansas driving has been so uncomplicated because of how flat the land is here. All the roads are pretty directly north, south, east, and west. No problem! Or so I thought as I left my house the morning of pick-up and headed on my way to load up my van with 20 boxes of peaches for Nancy and her friends. This is so easy, I reasoned, that I don’t need my GPS system. I don’t even need to look at my navigation system on my Blackberry or check a paper map. I’ll just get on Highway 54 and go west to the Cheney exit, go south to MacArthur, and be there in no time. The day was bright and beautiful as I drove west on 54. 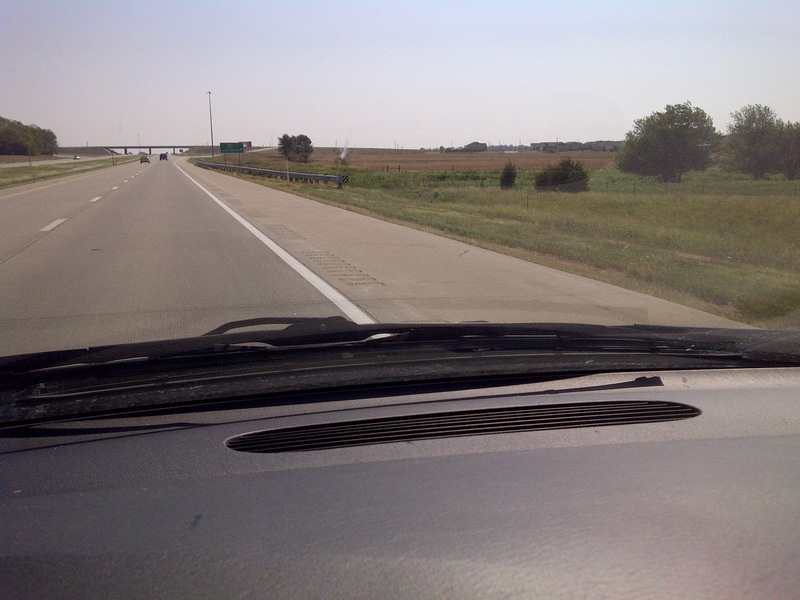 I drove and drove, and drove some more – until I started feeling like I was surely farther west than I should be. Had I somehow passed the Cheney exit? Feeling unsure, I got off at the next exit and called a friend from Goddard that I was meeting later for lunch. No need to check a map, I thought. She wasn’t quite sure if I should continue west or head back east, so I chose to turn around and drive back east, retracing my “steps” as I carefully watched for the Cheney exit. No exit. OK, I thought, I’ll simply turn south and drive to MacArthur. Several miles later found me, finally, on MacArthur. I was feeling a little silly but happy to finally be on my way. I had plenty of time to get there and claim our peaches. Then I saw the sign. Road closed ahead? Surely not! That must be a leftover from past road construction that the crew forgot to remove. On I drove, saw another sign, and soon came upon – the closed road. A bridge was being replaced, it appeared. The car behind me turned north onto a dirt road, so I followed. Now I could hardly see from the billowing dust that the car ahead of me was stirring up and my clean van was soon covered in brown dirt. I bumped north over that dirt road, came to another dirt road that went west, and yet another dirt road that took me south again back to MacArthur. Good grief! I was so happy to finally see the house with the long white fence and other cars there waiting for boxes of peaches. Except there were no peaches! Nancy’s uncle said that people were in line at 6:30 a.m. so when the truck came, the peaches sold within minutes. A wasted morning? Not really – because as I drove away I had time to think of how like my life this little escapade could somtimes be. Aaron has never been a fan of sports, especially if he’s the one expected to participate in them. We endured a season of T-Ball on the military base in Germany. Usually you would find Aaron sitting way in the outfield in the grass, picking in it and tearing it into little pieces like he still enjoys doing. When the ball would come his way, he wouldn’t budge. It would fall in the grass and roll right past him as he sat there watching it with a very unconcerned look on his face. No matter that parents and children were yelling at him to GET THE BALL!!! One season was enough for us. And for the parents and the team. When we moved to Wichita, we decided to take the kids to see our local baseball team play. It was a sunny, beautiful day. Perfect for baseball! Off we went to Lawrence Dumont Stadium in downtown Wichita to see the Wichita Wranglers get some home runs – hopefully. We knew that Andrew would love to see the team play and that Andrea would enjoy it, but we weren’t sure about Mr. I-Don’t-Like-Sports Aaron. We settled in on the bench and soon realized that it would take a lot of persuasion to assure Aaron that this day was FUN! Aaron didn’t like the hard bench; Aaron didn’t like the hot sun; Aaron didn’t like the baseball cap we hoped he would wear; Aaron didn’t like the dumb baseball game; and Aaron didn’t like his ridiculous parents for bringing him to such an unlikable event! We also soon realized that there was not enough hot dogs or popcorn in the whole stadium to soothe our grouchy Aaron. We put him between Gary and I so we could double team – and we tried to enjoy the day. Just down from Gary, sitting on the same row as us, was a man who was very loudly and exuberantly getting into the game. He wasn’t drunk and he wasn’t mean, but he was just having a blast. He cheered the players and he booed the players; he yelled at the refs and he cheered the refs; he made his own calls and he agreed with other calls; he swung his arms and he stomped his feet; and he did it all with great gusto. And did I say that he was LOUD? Aaron doesn’t do loud. He had to be removed from the classroom in second grade when the class practiced Mexican music using castanets. He called our VBS director in Arizona Miss Yeller because she would yell “Yee Haw” during our western-themed Bible school. Oh, and our neighbor down the row was not only loud – he was very big. Big neck; big arms; big hands; big all over. Big and loud! We sat there trying to assure Aaron that he was having fun, but all the while Aaron was becoming more and more agitated about the big man down the row that was yelling and laughing all the time. The Very Big Man. And before Gary and I saw it coming or could stop it – Aaron leaned across Gary and in a voice meant to match the Very Big Man, Aaron glared and yelled, “BE QUIET!!!!!! !” Gary and I instinctively jerked Aaron back at the same time and hissed at HIM to “be quiet!” I’m sure Gary’s life flashed before his eyes. I wondered how I would raise three kids alone. But the Very Big Man didn’t seem fazed by any of this. He continued having a great time, we continued calming Aaron, and I have no memory of any of the rest of that game. I do know that our list of “Things NOT to Do With Aaron” had another addition that day. Gary shared the happy news with me last night after he came in from his daily stroll around the yard with Jackson and his check on the garden. We have a tomato!! Yes – A tomato! But believe me, in this dismal tomato year even one tomato is cause for excitement. And so this morning as I watered the front flower beds I was anticipating my time with my veggies and getting to pick our lone tomato, which I would share with Gary tonight at supper. Soon I was in the vegetable garden, looking and searching for our surprise tomato. Which plant had Gary said it hung upon? This one? No. Must be the next one. Funny how they can hide from view so easily. I was so engrossed in finding our tomato and so happy when I finally saw it that I very nearly walked right into a spider web. 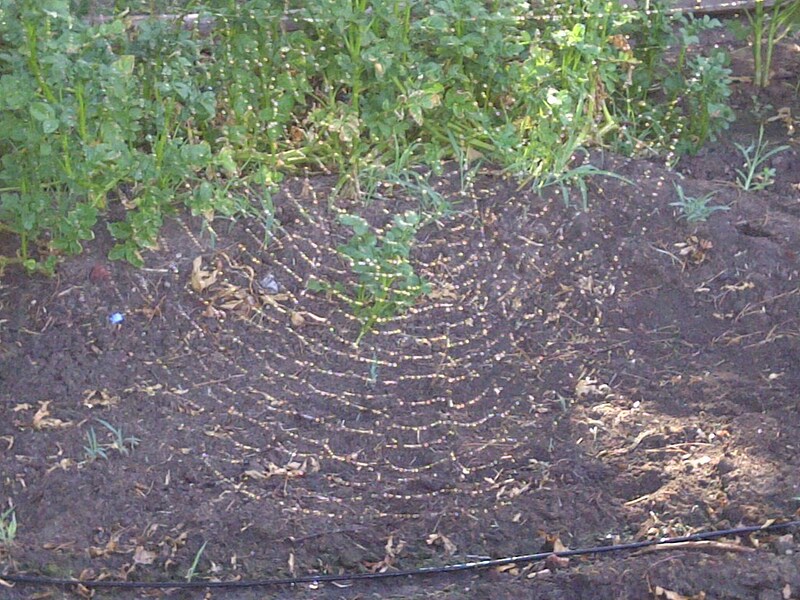 Spiders and their webs are the one thing that will run me out of a garden – even more than a snake, believe it or not! In fact, Gary has given me a piece of wooden plank that I call my “spider stick.” I can wave it in front of me as I work in the garden when the plants are becoming tall and bushy, knocking down webs and sometimes squishing the spider that lives there. I look pretty weird to my neighbors, I’m sure, but it works. However, no thought of spiders or webs entered my mind this morning because I was completely focused on this tomato delight that awaited me. What a close call that was, I thought, as I backed up and then looked for the unseen spider. Later as I sprayed water on our thirsty garden, the gentle spray from the water highlighted the web and the little hiding spider ran out to see what was happening. Now I know where that web is and can avoid it, or perhaps destroy it. Sometimes in my life I become so engaged in heading a certain direction or accomplishing a certain task that I become unaware of the dangers around me. My life can become so busy in the doing of tasks that I become lazy in being the woman that God wants me to be. It’s easy to slack off on my quiet time with the Lord, for one thing, and if I’m not listening to Him speak through His Word and not praying my heart to Him then I am in serious trouble. I run a great risk of becoming entangled in the web of self-importance, pride, or discouragement. At times the tasks that we all undertake are good or pleasurable or even productive. But do they keep us from time with the Lord or from fellowshipping and worshipping with our church family? Are we so engrossed in our activities and busyness that we forget to be watching for the one who seeks to devour us? Paul told the Ephesian believers to “be on the alert” and to “stand firm against the schemes of the devil.” And just as the gentle water revealed the spider web and the spider, the water of God’s Word will reveal to us the schemes of Satan and the webs that he weaves in order to entrap us. But we have to be reading and listening, arming ourselves with God’s power, and walking with our heads up and our eyes alert for the webs that are all around us. I never imagined that I would be thankful for the spider and the web in our garden today, but I am thankful for the lesson that God taught me using one of His scary creatures! As funny as Aaron can be, he can also be very frustrating and hard to tolerate. He’s so much better now than he was when he was younger, though. As I’ve said before, puberty was especially difficult as he struggled with the highs and lows of hormones, which aggravated seizures and autistic behaviors terribly. Siblings of these special children suffer at times as much as, if not even more than, we parents. Andrea and Andrew had times when they were very embarrassed in public by Aaron, or were extremely frustrated by the way Aaron disrupted our home life. Now that they are all older, things have mellowed a lot and we’re very thankful for that! I remember when Aaron was a student in the day school. We had come out of two very rough years in another school and we were tense about how Aaron would fare in this new school. The day school would choose a word for the week – a word that exhibited a good character trait – and encourage the students to demonstrate that quality all week. On Friday, one student would be awarded the honor of being Student of the Week based on how well they lived out the positive character traits of the chosen word. One Thursday night our phone rang. I picked it up to find that Mr. Z, Aaron’s teacher, was on the line. 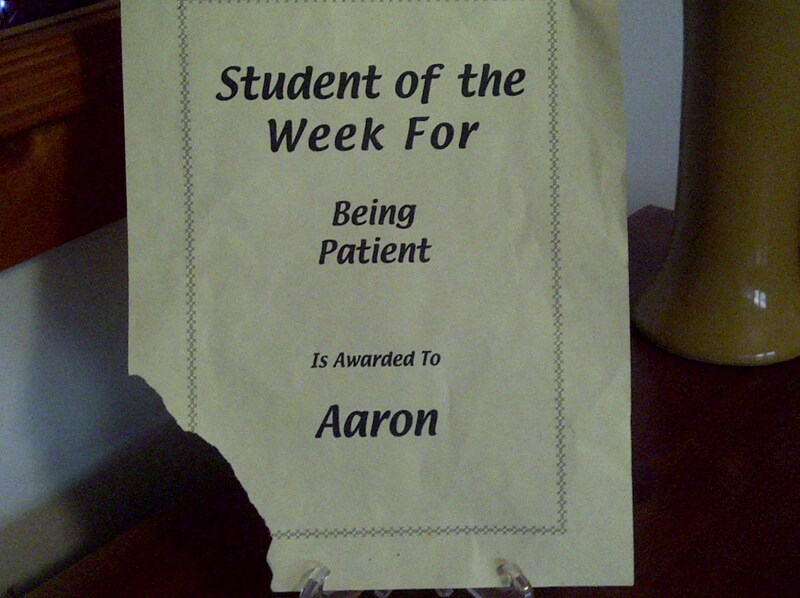 He explained to me that on the next day, Friday, Aaron was going to receive the Student of the Week award! I was sure that Tom must have the wrong number! Certainly he meant to call the parent that was next on the list, not us! Aaron?? Student of the Week??!! And when he assured me that, yes, it was indeed Aaron who was the next Student of the Week – well, it was as if the Nobel Prize Committee had called to award Aaron a Nobel Prize! That’s how shocked and proud we were. And the character trait that Aaron had demonstrated? It’s a good thing I was sitting down! It was – BEING PATIENT!!!! We were stunned! We didn’t even realize that Aaron knew that this was a word, much less knew how to exhibit such a trait! You think I’m exaggerating, but you had to know Aaron. Tom told us not to tell Aaron, but he wanted us to know early. Oh my goodness, I was so excited! Aaron was in his room, so I hurried downstairs to tell the others. I zipped in to the room where they were and said, “GUESS. WHAT?! Tomorrow Aaron is going to be the Student of the Week!!! !” Gary, Andrea, and Andrew stared at me as if I had grown a second head. Then I said, “And guess what the word of the week is? !” And without skipping a beat, Andrea matter-of-factly replied, “Hateful?” I had to laugh! Oh, how well she knew her brother! Then we all laughed and laughed when I told them what the word of the week really was. We were happy for Aaron and very supportive of him when he came home the next day with his award. We also wondered when the concept of Being Patient would kick in at home. Still waiting on that some days, actually. It’s a little worse for wear, but here’s the proof! Author hesaidwhatksPosted on September 26, 2011 February 28, 2016 Categories Uncategorized3 Comments on Student of the Week??! !